Collage crafting fun! My daughter created this green themed "ecollage" for the OK Go contest at Tara Lazar Writing for Kids (While Raising Them). Win a copy of OK Go by Carin Berger. Last day to enter is May 12th. Very cool collage! Love the eco theme! Your daughter did a great job! Good luck in the contest. Thanks for sharing. Happy WW! that's worth framing! a beautiful reminder that is recycled itself! What a great collage and an even better message! Happy WW!! Fantastic collage! We are huge fans of the collage at our house too! We love collages too. Love the theme-very cute! Wow..tell her she did a great job! 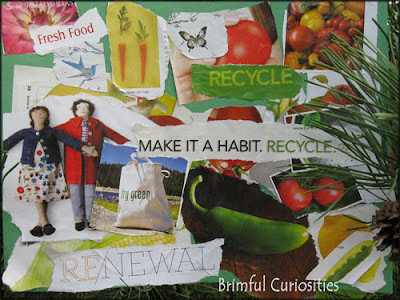 I used to love doing collages for school! Looks great!! How Fun and Creative!! Wow, that's impressive! Great colors and everything! She did so good! That is a great entry & what an interesting book (Ok Go). Thanks for sharing & good luck to your daughter!